Modules! They look really cool. Sadly, that's about all I was able to take away from a brief hands-on opportunity with Google's beautiful, exciting, not-coming-to-a-store-near-you-anytime-soon Project Ara modular smartphone. You see, all three prototype devices Google brought to the Project Ara developer conference have a bit of an issue right now where the touchscreen doesn't work, and you kind of need that touchscreen to unlock the phone and tell whether any of those modules are actually being nice and modular and hot-swappable and magnetically locking in place and electronically acting like they should. But they sure do look really cool. So I took a lot of pictures of those modules. Find them below. 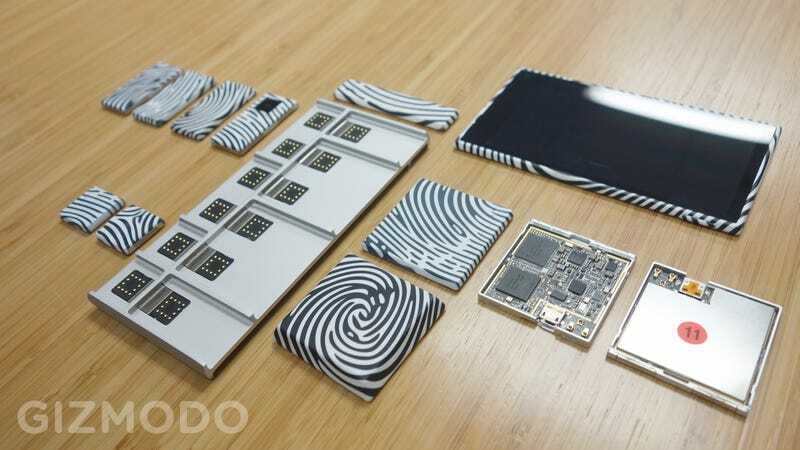 In case you're not familiar, the idea behind Project Ara is that you can basically build your own phone. Google provides an "endoskeleton" which holds a whole bunch of hot-swappable modules that act like a miniature network, adding up to a complete device. You can pull them out and replace them with other modules anytime you want—say, trading your speakerphone for a pollution sensor on the fly. Or start with an endoskeleton with a BlackBerry-sized screen and physical keyboard, perhaps, instead of a modern pebble-like design. You'll also be able to personalize your phone by customizing those building blocks with patterns and images of your choice. When you buy one, Google imagines that it'll even have software ready that can crawl your social network feeds to use your own pictures, or pictures that you've previously liked. And though right now, the modules are limited to pretty mundane things you'd already expect your phone to have (screen, earpiece, speaker, Bluetooth and Wi-Fi, 3G cellular, camera, USB, battery, and the processor), companies could create all kinds of crazy modules much the way they create apps today. Talk about futureproof devices: whenever Qualcomm comes out with a new mobile processor or Samsung with a hot new high-def mobile screen, they could toss it into a module for Ara smartphone owners to buy. You could trade modules with friends, or resell the old modules as you upgrade. Kind of like desktop PCs. You've owned a desktop PC, right? Still, there's just no way to tell at this point whether Google ATAP team has truly made it happen: whether this is the future of smartphones or just a really cool side project that might go extinct. Google's currently only committed to a tiny launch in Puerto Rico, as a testbed to see whether or not it got the idea right. Google ATAP's stated mission is to see if it can turn a potentially disruptive technology into a commercial reality within a tight two-year deadline, but it does seem like Google might be bending that rule this time around. Google ATAP's leader, former DARPA director Regina Dugan, said that ATAP might take "another two-year swing at it" as long as they know why their efforts failed. As of today, they've got a pretty damn cool looking prototype which isn't quite competitive with current high-end smartphones, as it's only got a low-res 720p screen, a 3G modem, and a tiny battery that can't yet last close to a full day. It is reasonably thin, though! It's a prototype, so we can't expect too much, and better components are coming before the Puerto Rico launch later this year. Google wants to ship with 20-30 modules to start. But I want to see Ara really working, doing smartphone-y things, before I let this awesome concept steal my gadget-loving heart.